Well, obviously here at Love Being Alcohol Free, we are a little biased and we always like to offer people one of the alternatives to Alcoholics Anonymous. Having said that, we are totally supportive of the excellent service provided by AA, and we never wish to be critical of an organisation that has saved so many lives over so many years. But for some people, who may wonder what are the alternatives to AA, we like to provide a different approach to the same problem of becoming alcohol free. What Other alternatives to AA are there? So we did a little research of our own, looking to find what are the alternatives to AA. And surprisingly, we found that there are alternatives, including some research into the effectiveness of the alternatives to attending AA, and why some people like to find an alternative to AA. The original concept of Alcoholics Anonymous was founded on a 12 step program to withdraw from alcohol. The participants were encouraged continue with an ongoing support program with like minded individuals. One of the philosophies of the 12 step program was that there was a higher power (God) who overlooked us all, and that ultimately could be relied upon to be the savior. Without trying to be judgemental, it seems that one or more of these values are not attractive to everyone. What are the alternatives to 12 step programs like AA? There are no surprises that some people are looking for alternatives the the 12 step programs like AA. The other worrying fact about AA is that not everyone who undertakes the 12 steps seems to be immune from relapse. So are there any other options as an alternative to AA? And what is it that seems to polarise the attitudes to people about AA and the 12 step program? Are there any viable alternatives to AA? We found that there was a study conducted into the success of the original Alcoholics Anonymous system and the various alternatives of 12 step programs. The study compared the results and outcomes of people within an AA program, as well as other systems such as SMART Recovery, Alcohol Rehabilitation, Women for Sobriety and Medical Rehabilitation. And why not include Love Being Alcohol free as a non religious AA alternative. The good news is that other alcohol support systems have similar results as the 12 step program. So there is definitely a range of options for people who seek different alternatives to AA. Why the need for Alternatives to AA? Over the years, there has been a lot of scrutiny into the alternatives to AA, because there has been seen to be a need to fill the gaps. The study showed that Alcoholics Anonymous served about 30% of participants with a satisfactory solution to their problem with alcohol. Another 30% managed to withdraw from alcohol initially, but found themselves unable to maintain their sobriety in the long term. And even more worryingly, the remainder of people who need help, did not receive the support they needed, or withdrew from then program. So there is a massive gap to fill in terms of the people who may be seeking alternatives to AA. This is where it gets really interesting when it comes to looking at the different alternatives to AA. There is little doubt that participants in a 12 step program are encourage to totally abstain from alcohol. In what could be considered as a very hard approach to the problem of alcoholism, AA believes that an alcoholic suffers from a disease like condition that can never be cured. Therefore the individual is constantly reminded of the threat of relapse, and is required to attend regular ongoing meetings to avoid temptation. Would you prefer a non religious AA Alternative? Other programs are a little more lenient when it comes to recovery from alcoholism, and teach people to drink in moderation, or to quit drinking completely. Other programs are not reliant on any spiritual aspect, nor require that people become religious, so it is possible to find non religious alternatives to AA. Why we need alternatives to AA? No matter how you consider it, some people love AA, and other people hate the idea of AA. The problem lies in some of the discussions about AA that we have raised. The spiritual aspect seems to drive some people away. The very public announcement that “Hello my is blah, and I am an alcoholic” may also turn some people away. This does not sound entirely anonymous does it? The need to participate in a social environment is another turn off, even though the support program is a major feature of the 12 step model. The 12 step programs just don’t work for everyone, and presumably these people seek alternatives to AA. Why do we need a support program to quit alcohol? The ongoing battle to overcome alcohol dependency does not simply stop after 6 days, or 21 days or any fixed amount of time. It is a process, which can be very rapid for some or may take a little longer. But support is very important, because there will be difficult days, or moments of doubt, and times when resolve is under strain. The support aspect is vital in any program including AA, or any other alternative to AA. Is there a risk of relapse if I choose an alternative to AA? It is relatively simple to give up drinking in the short term. But for many people, it is more difficult to give up drinking over the longer term. Unfortunately, many people do the hard work to give up drinking initially. But sometimes they succumb to the addiction of alcohol and find themselves drinking again. It is an unfortunate reality that after drinking alcohol. The brain develops a system of wiring and triggers whenever we think about drinking. What this means is that there are many triggers that our brain reacts to when it comes to alcohol. Sometimes we may not even be aware that it is happening. How long does it take to actually become a non-drinker? In the short term, you need to carefully withdraw from alcohol. Especially if you are a heavy drinker. Please consult with a medical professional if you want to give up heavy drinking. But no matter whether you rely on medical help, attend rehabilitation, or give up drinking by yourself, alcohol withdrawal is possible. With satisfactory will power and the determination to give up drinking, it can be achieved. And in a short space of time. The most immediate hurdle is to overcome cravings for alcohol. Again, please consult medical advice before going cold turkey. Severe withdrawal symptoms can result in tremors, or even lead to seizure. Cravings for alcohol can last up to 21 days, but will gradually subside over this period of time. Be aware that if at any stage you succumb to the cravings, then the 21 day withdrawal cycle will be reset. And you will have to manage cravings for another 21 days! The problem with giving up drinking is that will power and determination to give up drinking may not be enough. Sure these factors are important to help achieve that goal. But the real issue is to stop drinking and stay stopped. And that can take a little longer to achieve. The issue here is that we need time to re-wire our brain. We need to develop the belief that we no longer want to drink alcohol. Giving up alcohol is a valuable first step. But the longer term goal is to train our brain into new thought patterns, and this takes more time. The path to re-wiring the brain is a literal minefield of triggers and unresolved issues. These hidden emotions can pop up to surprise us at any time. 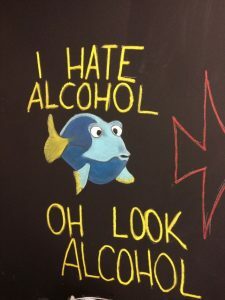 Inevitably there will be some significant experience or unresolved issue that reminds us that we used to rely on alcohol as a solution to that old problem. These powerful triggers can re-emerge at any time, and cause us to relapse and start drinking again. The time taken to develop new patterns or new wiring can vary from one person to another. It depends on how long the pattern has taken to establish. It may surprise people to find that even 6 months after giving up drinking alcohol, there remain powerful associations with past behaviors. If we continue to think about drinking, then it is likely that we will continue to have associations with drinking. This causes an ongoing risk of relapse with alcohol. Which is a shame when so much effort goes towards the quitting process. As we discussed earlier, participants in the AA system are constantly reminded that they suffer from alcoholism for life. The problem here is that they are constantly reminded of what they DON’T WANT (alcohol). Rather than focus on alcohol, why not change their thought process away from alcohol? This is actually one of the basic philosophies of psychology. The things we constantly think about, can be manifested into our lives. If we constantly think about alcohol, then it is almost inevitable that it will come back into our life. Here at Love Being Alcohol Free, we prefer to change the thought process completely around. 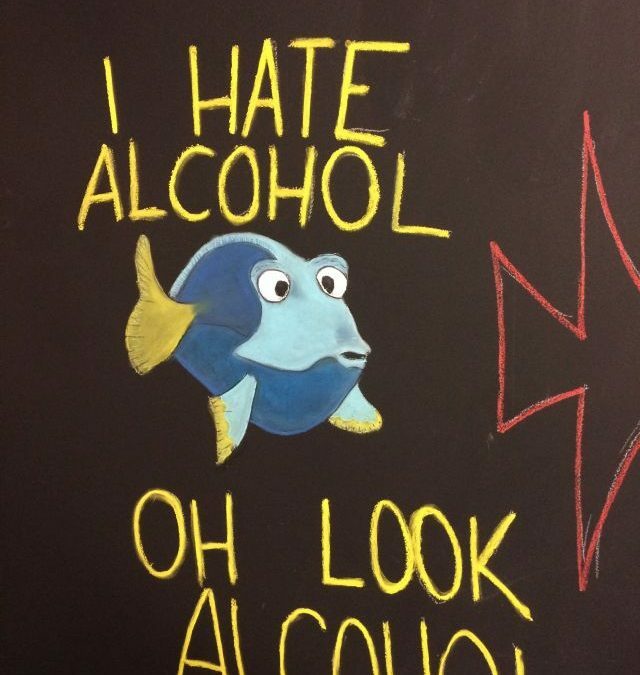 Rather than consider ourselves as alcoholics (shudder) we prefer to focus on the positive. Maybe we shouldn’t continually remind ourselves of the dangers of alcohol. Instead we could choose to focus on the benefits of being alcohol free. Rather than focus on what we cannot have, we prefer to live in the pure enjoyment of life. It is much better to be grateful for what we do have. Try it, and you will see for yourself why we love being alcohol free!